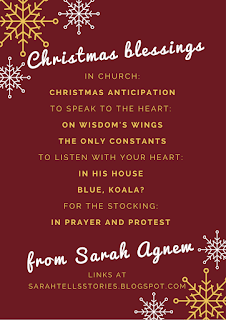 From Sarah Agnew to your worship celebrations and under your tree: gifts of story and poetry for Christmas. This is a bargain, with stories, play scripts, liturgies, poems, and prayers for a very small fee. Enough to keep the Advent, Christmas, and Epiphany stories alive for years to come! On Wisdom's Wings Sarah's first collection of poems tells stories of discovery of self, love, healing, God, place in community. The Only Constants This collection of poems depicts life in a season of change and the threads of friendship, love, and Sacred Presence that remain constant throughout. In His House Stories and poems composed and recited by Sarah for your listening pleasure. Woven through with inspiration from her beloved Shakespeare, these pieces travel through love stories, the intrigues of spies, battles with depression, and a pilgrimage to a dream come true. People have been listening to Blue, Koala? and sharing their responses to the story. Here is a selection for you to muse on, and be inspired to listen (and maybe even purchase and download) the story for yourself! I love the story. It took me on a trip, panic as I reflect on friends who are often in a hole and me unaware. But also joy, so hear that people kept looking and kept close by even when not ready to come out of a hole. I need reminding that those people are in my life too. A resource I hope to use with my young people - where appropriate. And for personal reflection. What a beautiful gift to the world. 'Me too'. On being sold lies about beauty and human dignity. Today I posted the 'me too' status update on Facebook, along with many, many – too many – women who are showing in the weight of numbers of these updates just how prevalent the sexualised objectifying of women is in our society. My sisters were concerned. For the 'me too' statement says the one posting the update has been sexually harassed or assaulted. I didn't mention – but I am now – the groping in a swimming pool when I was in my early teens, by a boy I didn't know, didn't even see as he swam past and copped a feel. I don't think I've mentioned it to anyone but the friend who was with me at the time as I surfaced, gasped for air, stunned almost to speechlessness. Truth be told, most of the time it lies forgotten. I shook it off as the immature idiocy of a teenage boy; but underlying that response is the deeper disturbance of being treated as an object that boy thought he had a right to touch, uninvited. This is the story into which we are born, called, and must choose each day to embrace or reject. I have spent a lot of time over these three years in Edinburgh with Paul’s letter to the Romans as the test case performance at the heart of my PhD (which is now submitted and in the process of being examined). Most themes and stories and experiences now call to mind for me something from the letter. And so it has been with the theme for today’s worship. These words come early in the letter. In this video, I tell you some of the story behind my new album, Blue, Koala?, which will be released on 10 October 2017. I'm quite sad this morning. The call for a change to the marriage laws in Australia is stirring up some fear in many, and I struggle to understand what it is people are afraid of. This fear is evoking harmful behaviour, vitriolic language, and blatant lies. As it stands, the dominant view of marriage excludes many from the choice to have their life-long partnerships recognised by the laws of our land. That directly and negatively affects those people and their families. A change to the law will open the definition, and directly and positively affect some of our fellow Australians. It will not change the understanding of marriage for those who want to view it differently: your views are yours and can be what they are. It will not stop men and women from marrying each other.